The forearm is composed of two bones, the radius and the ulna. The radius is larger at the wrist. Patients who fall often fracture the radius. The radius is the third most common bone to be broken in the human body. The forearm connects the elbow to the wrist, allowing the hand to be placed into a functional position. The forearm is composed of the ulna and radius. The radius serves two purposes. First, it articulates with the wrist to allow the wrist to bend and extend. Second, it articulates with the unlna to allow the hand to be turned palm up and palm down (pronation and supination). Almost all distal radius fractures occur as a course of trauma—the vast majority are due to falls on an ourstretched arm. Patients tyically report pain, swelling, deformity, and bruising of the wrist. Inhibition of finger and wrist motion are also common. An examination of the sensation to the hand is performed. Sometimes patients with wrist fractures may have injured the nerves associated with the hand. The most common nerve injured is the median nerve, resulting in numbness in the radial three digits of the hand. The blood flow to the digits is checked. Swelling from the fracture may cause compression of vascular structures leading to changes in blood supply to the hand. Any deformity of the hand or wrist is also noted. X-rays of the wrist are obtained and if there is suspicion of injury to the hand, elbow or shoulder these may be obtained as well. X-rays help delineate the type of fracture, displacement and if the fracture extends within a joint. Typically routine x-rays are sufficient, although they may be taken from many angles. At times, enhanced imaging including CT scans or MRI is a helpful adjuvant. X-ray will confirm the direction of the injury. The most common displacement of the fracture is upward as seen in the image above and below. When the fracture displaces upward or outward it is termed a Colles fracture. A fracture extending in the opposite direction is called a Smith fracture—only about 10% of wrist fractures are Smith Fractures. 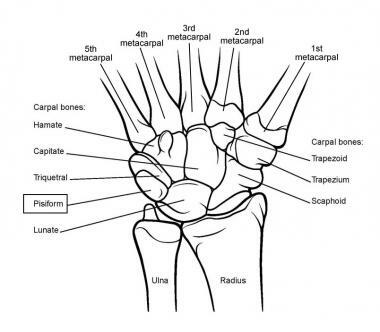 X-rays will also determine if the fracture is comminuted (many pieces) or if the fracture extends into the articular surfaces of the wrist or ulna. X-rays will also determine if the fracture is displaced. Fractures which extend into the articular surfaces are more prone to have difficulty with range of motion and arthritis after healing. In Type 1 factures above the fracture fragments are well aligned or nondisplaced. 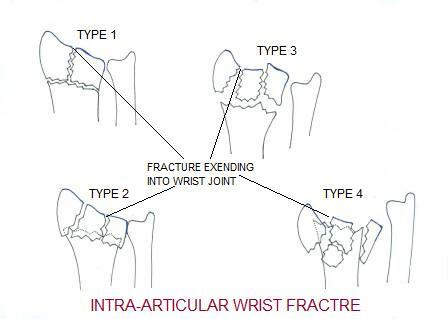 In both type 2 and 3 there is displacement of the fracture fragments. These fractures extend into the joint. However, in type 1 the fracture shows no displacement. In types 2-4 more displacement of the intraarticular fragments are shown. Fractures without significant displacement may be treated with splints, casts or braces. The length of immobilization may vary and after immobilization work is aimed at restoring wrist motion. Therapy for wrist and hand is common after these injuries even without surgical treatment and may require the utilization of a hand therapist. Fractures which have significant displacement of fracture fragments typically require realignment. Fractures which show significant angulation of the distal radius for Colles fractures with over 10 degrees of dorsal tilt are candidates to improve alignment. 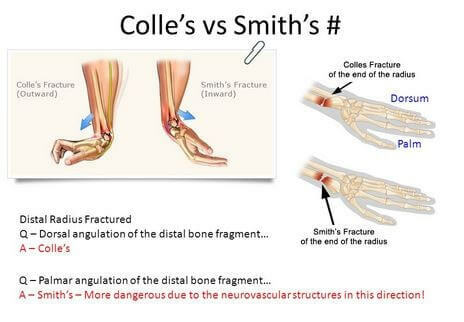 Most Smith fractures are unstable and will require operative alignment. Fractures which have greater than two millimeters of intraarticular displacement are also candidates for improved alignment. Other criteria for adequate alignment also exist, but are not as correlated with overall results as angulation and intraarticular displacement. 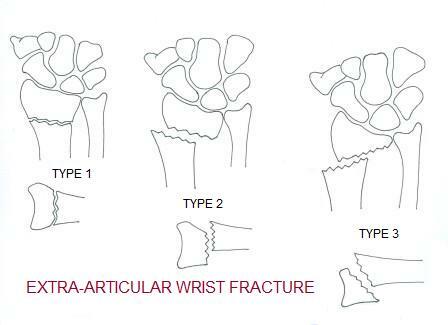 Historically, there have been many methods to address wrist fractures. Surgeons have utilized pins, pins with plaster, and external fixators. Although many techniques have been utilized in the past, most modern fracture surgery involves the application of plates and screws. Image at left shows an extra articular displaced distal radius fracture. The fracture is treated with application of plate and screws from the bottom (volar) portion of the wrist. Most wrist fracture surgery can be completed as an outpatient surgery and the majority done under regional anesthesia. The typical incision is on the bottom side of the wrist approximately 3 inches in length. Most commonly, specialized plates and screws are utilized to stabilize the fracture in better alignment. These plates and screws typically do not need to be removed. 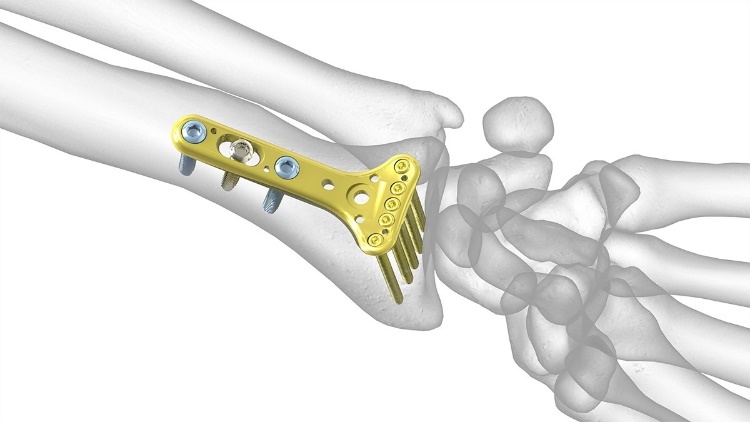 A distal wrist plate for fractures manufactured by Acumed. Patients are placed into a splint after surgery and typically return in two weeks for suture removal. Patients who receive regional anesthesia report less pain after surgery, but all patients should follow instructions regarding pain medications to improve their postoperative experience. Once patients recover from the surgical pain of application of the hardware, most report considerable improvement in their overall wrist discomfort. After surgery patients are instructed in elevation of the extremity and work on range of motion for the digits. At two weeks most patients are placed into a removable brace and some may begin work on wrist range of motion at this stage. By six weeks after surgery, most patients will have considerable healing of the fracture will likely start weaning from the splint. Work on range of motion for the wrist can be accomplished at home or with the help of a hand surgeon. Strengthening of the hand, wrist, and arm are emphasized and most patients should gain good use of their wrist and hand—especially with diligent work on motion and strength. Modern fracture care has greatly improved the results for patients. However, patients can still expect some degree of stiffness with any fracture care. Return to sports after injury typically requires 3-6 months. Patients report continuing improvement for up to one year after injury. There is an association of osteoporosis with this injury and patients should check with their primary physician regarding this entity.